One of the best ways to take in the iconic sights Dubai has to offer is soaring over the cityscape with a helicopter flight. Dubai’s popular landmarks, from the Burj Khalifa and the Palm Islands to the five-star properties lining the Jumeirah coastline, are best viewed from the sky. Hop on board a helicopter and take off on a thrilling airborne adventure with HeliDubai for a fascinating glimpse of the metropolis, ideal for those looking to cover maximum ground in a short span of time. 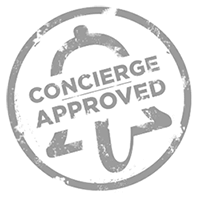 myconcierge members can choose from four exclusive tour packages with 12, 17, 22 or 40-minute helicopter flights. The 12-minute Iconic Tour takes you on a scenic journey from the old to the new. Departing from Dubai Police Academy, your helicopter follows the Creek all the way to the emirate's historic neighbourhoods in Bur Dubai. Enjoy views over traditional wind towers and the souks, and soar past the sprawling golf course at Dubai Creek Golf & Yacht Club. Glide into the future and take in the scenic Jumeirah coastline before making your way to Burj Khalifa, the tallest tower in the world. The 17-minute Palm Tour, available exclusively on a limited basis, gives you the chance to get up close with The Palm Islands and offers a fascinating view of this manmade wonder. The 22-minute Vision Tour follows the same route as the Heritage Tour, but with a little more insight into Dubai’s futuristic developments. After soaring over the city's cultural districts, enjoy a bird’s eye view of the architectural marvels including the Palm Jumeirah, the World Islands and the plush resorts that call these landmarks their home. The 40-minute Odyssey Tour gives you an aerial glimpse into Dubai’s historical and modern attractions. Soar over Port Rashid, the dockyards, Burj Khalifa, the expansive Meydan Racecourse, the sail-like structure of Burj Al Arab, the iconic Jumeirah Beach Hotel and the famed man-made island, Palm Jumeirah. For private helicopter tours and customised flight routes, get in touch with us at 800-CONCIERGE and we will tailor a bespoke package for you. All guests must arrive one hour prior to the scheduled flight for a safety briefing. All helicopter flights depart from Dubai Police Academy. All guests are required to present a valid identification card (passport or Emirates ID) upon check-in at the helipad. Flight routes, durations and schedules are subject to change due to Air Traffic Control regulations or other unexpected factors beyond reasonable control like weather, visibility conditions and technical difficulties. In the event of flight cancellations due to unforeseen circumstances, all flights will be rescheduled at the guests’ earliest convenience. Every guest on board is insured in accordance with the local UAE Civil Aviation Authorisation regulations. Only children three years of age and above are allowed on board the helicopter. Pregnant guests in their third trimester require a valid doctor's certificate stating that the guest is medically fit to fly. The tour operator has the right to refuse any person or carriage of any item if it is deemed unsafe or may cause discomfort to guests or crew. Any footage taken may not be used for commercial purposes and personal cameras must be limited to lenses less than 400mm. The tour operator bears no responsibility towards guests who arrive late for their tour. No refunds will be made in case of a late arrival or no show.